I love this series. It’s grown on me more and more with each book, and this one was no exception! 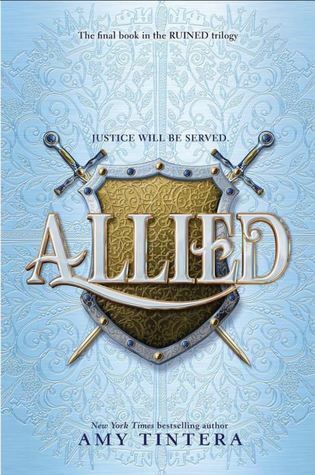 Allied is the final book in the Ruined trilogy, and it is a great conclusion. I loved this trilogy. It was so fun and fast-paced, with amazing characters and development, and this book just continues that trend. Allied takes place right after the events of Avenged and tensions are high. This book includes a lot more politics than the previous two, focusing more on Cas and Em dealing with the views of the people as they prepare for war against, well, pretty much everyone. I absolutely loved how the political side of this book was handled. It was really interesting and fun despite having a bunch of meetings with advisors. A lot of books make fantasy politics boring, but this one had me so excited about long discussions talking strategy. Allied also introduced some POVs that I loved and really fleshed out some characters that I felt really needed it. Honestly, this series really does just get better with each installment. It was in this book that you really see how our main characters have grown in this series and it was fantastic.